Popping up from below the forest leaf litter–look at this: is it a plant? A kind of fungus? If you are familiar with Indian Pipe, you might guess that these two organisms are related, and you’d be right. 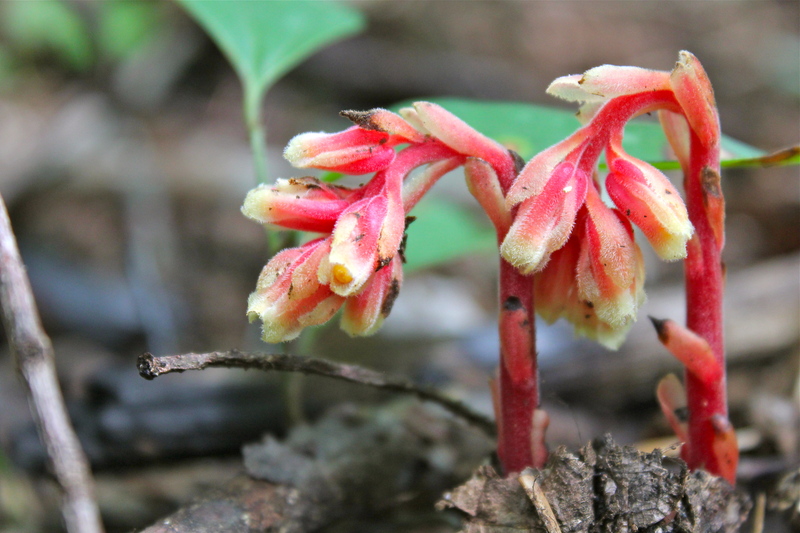 Pinesap, like Indian Pipe, is a non-photosynthetic flowering plant that gets its energy from organic matter in the soil. Specifically, pinesap is feeding on fungi that live in the soil. Technically, that makes this plant a myco-heterotroph. Most flowering plants are autotrophs, so this way of “making a living” definitely relegates pinesap to the “oddity of nature” category. That said, isn’t it cool? There is no real stem–the entire structure above ground is the inflorescence. Little leaf-like scales growing along the stalk are actually bracts. And each stalk holds clusters of small flowers, each about a half-inch long. As pinesap emerges from the soil, the flowers are nodding downward, as in the photo above. As the plant matures, the flowers raise their heads upward. Each flower eventually gives way to a seed capsule. Early blooming pinesap is cream-colored to yellow, while fall-blooming plants can be pink to red. The photos of red pinesap in this gallery were taken in late August in a damp forested area near Pandapas Pond. The name of the plant is derived from the location where the plant is usually found, which is under pines. Another common name for it is Dutchman’s Pipe. Here is a photo of pinesap coming up in late July at Pandapas Pond. Early blooming pinesap is yellow. I saw one of these today and thought it resembled Indian Pipe. I couldn’t rest until I found out what it is. Thank you for the great photos and info. Now I’ll be able to sleep tonight, LOL! I’m planning a trip in late July to UVA’s Mountain Lake Biological station, and hope to stop by Pandapas Pond on the way there. I’m looking for these yellow pinesap plants for my plant illustration work. Could you give me more details to help me locate these at Pandapas Pond? Also, have you come across any coral root orchids (Corallorhyza genus) in your wanderings? I have not found coral root in bloom myself, although I understand it is in our area. As far as Pinesap, you are likely to see it at Mountain Lake, but if you prefer to try Pandapas, I have seen it growing on the far side of the lake near the beaver pond boardwalk. By far side, I mean the side that is opposite the parking area side. Go to the beaver pond, cross the wooden boardwalk, re-enter the woods on that side, using the trail. As I recall, it was on the left side of the trail as it heads back to the upper parking area. The purple fringed orchid that I photographed last year was in bloom last Monday at Mountain lake. I did not see it, but a friend sent me a photo. It is right on the side of the trail that goes up to Bald Knob. Hello Gloria, I’d like to drive down to Pandapas Pond to get photos of the Red Pinesap for my botanical illustrations. I was wondering if this time of the year, mid to late August would be about right? Please let me know when would be the best time to visit to see these in the best condition possible. Thanks. I go out there fairly often and I will keep an eye out for Pinesap when I go. My photo meta data suggests early September, but rain and temps will determine that each year. I’ll let you know when I start seeing it!